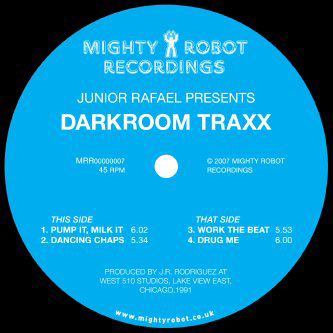 Billed by his label as a hitherto "undiscovered Puerto Rican Chicago jackin' genius", Junior Rafael has some hype to live up to on this, his debut release. The rather sinister opener 'Pump It, Milk It' is a full-on acid assault, calling upon vocals and the obligatory 303 and 808 sound palette. 'Dancing Chaps' might sound like a phrase pulled out of an Evelyn Waugh novel, but in fact, it's yet more bleepin' proto-techno. Probably the most developed track here, 'Drug Me' floats on a shifting bed of thorny synth stabs but keeps those acid boxes checked with all the right tweaks and modulations in place. Good stuff.